29 roses in red and white. There are many colors such as orange roses, violet roses, old roses, cream roses etc. 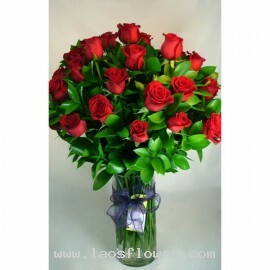 29 red roses arranged in a vase accents with green leaves. This vase is suitable for display on a wall or corner. We will add a bow to the vase. The color of roses can be changed as you want. Occasionally, substitutions may be necessary to create your bouquet due to the availability of certain fl..
A large bouquet of 29 red roses in round shape wrapped in pink paper and mesh and tied with purple ribbon. The color of roses and wrapping paper can be changed as you want. Occasionally, substitutions may be necessary to create your bouquet due to the availability of certain flowers in various pa..
29 red roses accents with green leaves in a clear glass vase adorned with a purple bow-tie. The color of roses and bow can be changed the way you like. Please order or request by email. 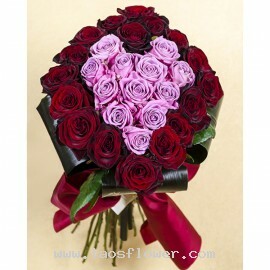 Occasionally, substitutions may be necessary to create your bouquet due to the availability of certain flowers ..
29 roses bouquet consist of 12 pink roses arrange in heart shape in the middle and surrounded by 17 red roses and decorated with leaves on the side. Wrapped in red paper and tied with a big red bow. 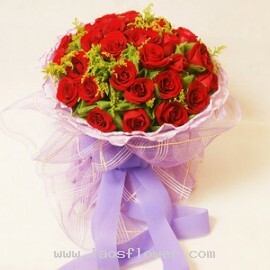 This sweet bouquet is good to sent to a lover or girlfriend. The colors of roses can be replaced or r..